2018 is expected to be another tumultous year for the healthcare industry. Yet for physicians and clinicians, the industry’s shifting tides will not be the center focus. Physicians will place increased emphasis on alleviating operational challenges, improving the quality of care for their patients, and tracking compliance with care plans to improve patient outcomes. 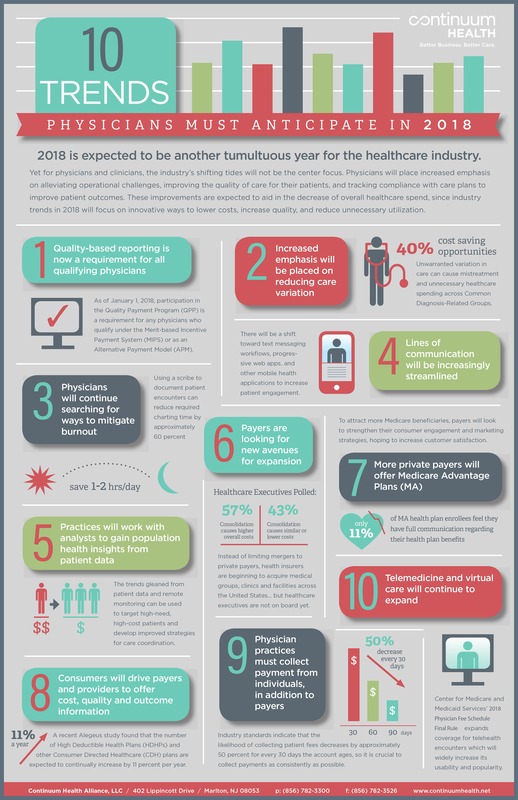 This infographic provides a summary of ten trends physicians must anticipate in 2018, and how these trends will focus on innovative ways to lower costs, increase quality, and reduce unnecessary utilization. Fill out the form on the right to download this infographic today.